Dr. Matthew Dicker and Dr. Ben Paxton, our fellowship-trained interventional radiologists, perform arterial procedures in the Cardiac Catheterization (Cath) Lab at Yavapai Regional Medical Center’s West Campus in Prescott. Our physicians perform minimally-invasive endovascular procedures using image guidance, which helps our patients avoid more invasive surgeries. PAD and PVD are two names for the same disease process: a common circulation problem in which the arteries that carry blood to the legs or arms become narrowed or blocked. This interferes with the normal flow of blood, occasionally causing pain, but often causing no symptoms at all. The most common cause of PAD is atherosclerosis, often referred to as ‘hardenings of the arteries’. Atherosclerosis is a gradual process in which cholesterol and scar tissue build up, forming a substance called ‘plaque’ that clogs the blood vessels. In some cases, PAD may be caused by blood clots that lodge in the arteries and restrict blood flow. Left untreated, this insufficient blood flow will lead to limb amputation in some patients. In atherosclerosis, the blood flow channel is constricted from the buildup of plaque, preventing blood from passing through as needed. This prevents oxygen and other nutrients from getting to normal tissue. The arteries also become rigid and less elastic, and are less able to react to tissue demands for changes in blood flow. Many of the risk factors – high cholesterol, high blood pressure, smoking and diabetes – may also damage the blood vessel wall, making the blood vessel prone to diffuse plaque deposits. ulcers or sores on the legs or feet that don’t heal or are very slow to heal. 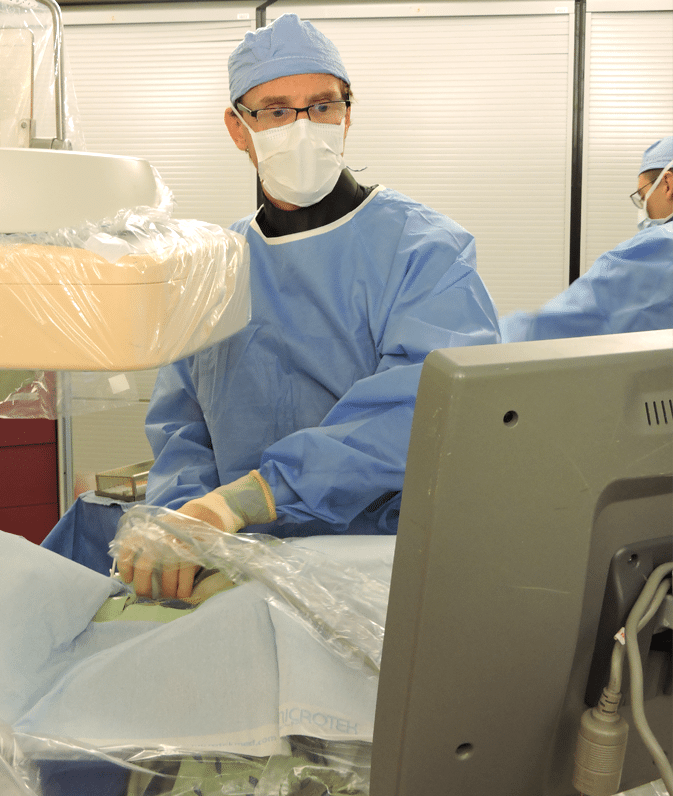 A peripheral angiogram is performed in the Cath Lab as an outpatient procedure. It is done to assess the degree of artery narrowing due to peripheral vascular disease (PVD), also known as peripheral arterial disease (PAD). During the angiogram, the doctor inserts a thin tube (catheter) into the artery through a small nick in the skin about the size of a pencil tip. Contrast, also known as x-ray dye, is injected through the catheter to make the blood vessels visible on the live, real-time x-ray. Our doctors perform angiograms to see if there is a blockage or narrowing in a blood vessel that may interfere with normal blood flow. Generally, our interventional radiologists can treat a blocked blood vessel at the same time the angiogram is performed. There are several methods of treating the blockages, including angioplasty, stent placement, and atherectomy. One or more of these procedures is performed at the same time as peripheral angiogram. These procedures enlarge the size of the channel within the artery, which increases blood flow and may improve wound healing and reduce leg pain when walking (claudication) or at rest. Increased blood flow can also lessen the likelihood of future amputation. After performing an angiogram and confirming a blockage, our interventional radiologist inserts a very small balloon attached to a thin catheter into the blocked artery through the same incision made for the angiogram. The catheter is threaded under x-ray guidance to the site of the blocked artery. 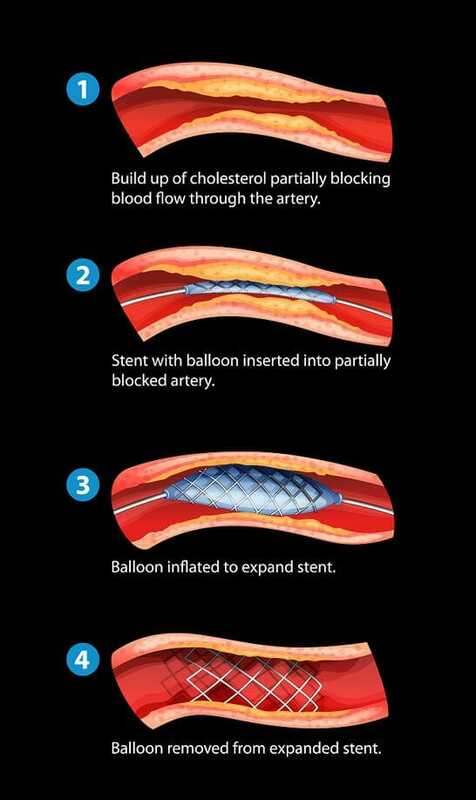 The balloon is then inflated to open the artery. Once the artery is open, the balloon is removed. In some cases it may be necessary to insert a stent as well. A stent is a small tubular metal scaffold that is placed across the blocked artery to keep it open and to increase blood flow. Atherectomy involves removing the plaque that is blocking an artery by “shaving” it off from the inside of the arterial wall. 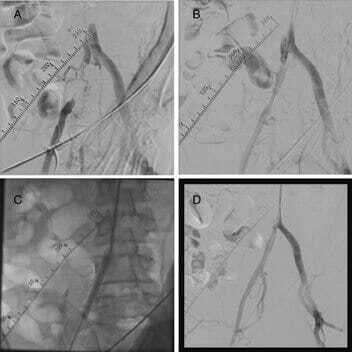 Atherectomy can be performed at the same time as a peripheral angiogram.